Our town centre is continually losing shops, first the independent trader and now the national enterprises are disappearing. In their place we are seeing more and more places to eat and drink. In 1972 I arrived in Sudbury on a late Sunday afternoon, in the middle of summer, feeling rather hungry (having travelled by train from the Humber via London to the town). When I enquired if there was somewhere I could eat I was told the only place for an evening meal was the Chinese restaurant at the end of North Street. Since then we have seen a complete change in providers of food – there are the pubs, several restaurants featuring different cuisines (Indian, Turkish, Polish, Italian) as well as tea shops, fast food providers (burgers, fried chicken) and of course various takeaway outlets. You can even stay at home and arrange delivery to your door. 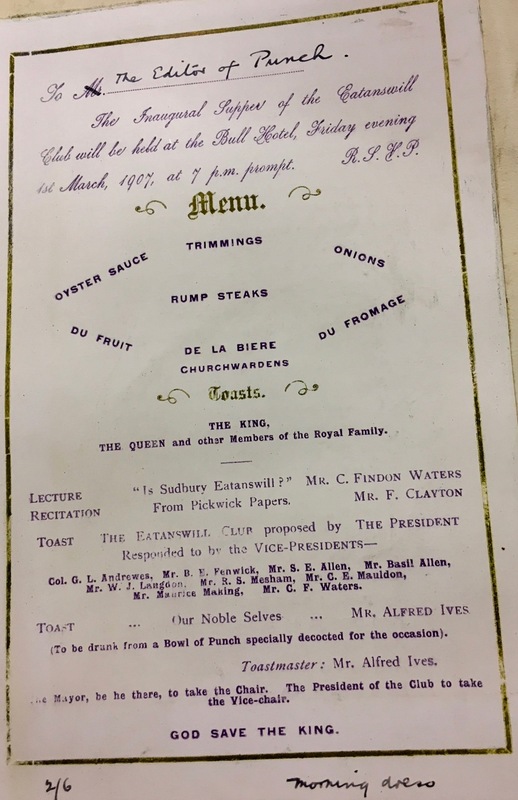 Not only have we seen this increase in refreshment establishments but also a change in demand from the public, the various television cookery competitions and channels have given rise to demand for elaborately prepared and beautifully presented meals. Now we are no longer content with soup, chicken in a basket or steak and chips. 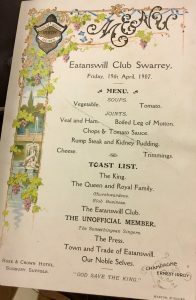 In the Sudbury Ephemera Archive we have a few menus from special events, such as the unveiling of Gainsborough’s statue in 1913, various celebrations for the Suffolk Regiment, a menu card from the Silkworm pub, and the famous Eatanswill club’s meetings and banquets at the Rose and Crown and the beginning of the last century. 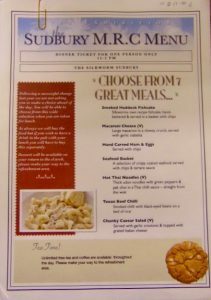 These all begin to give a picture of the food served and consumed in this rural East Anglian market town. 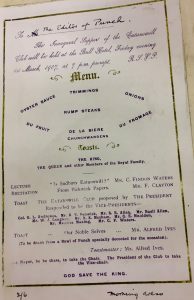 It would be great if we could receive more examples of such menus from the past 125 years. 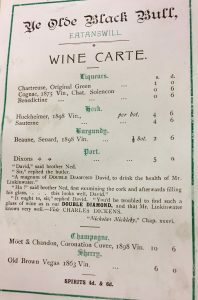 If you have any examples of local hostelry menus or even wedding reception catering, Sudbury Ephemera Archive would be pleased to receive originals or take copies of them. Another addition to this subject would be any recipes handed down from family members. 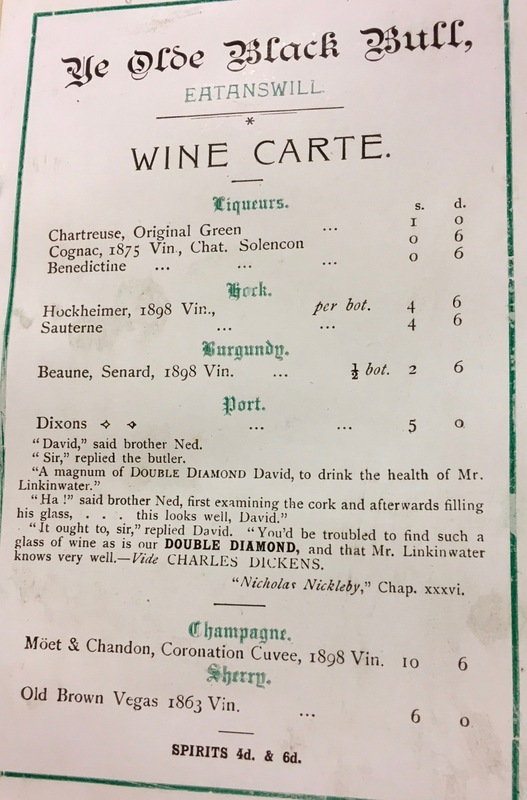 For more details of all the items we hold, see our Ephemera Catalogue.